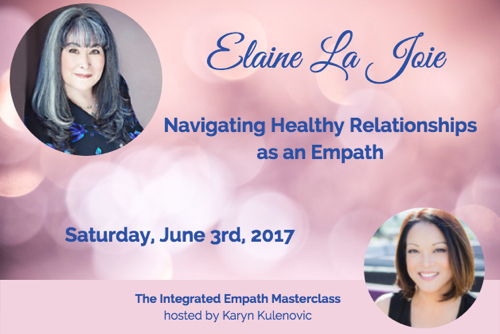 I’m very excited to announce that I will appear as one of the experts on Karyn Kulenovic’s Integrated Empath Summit. My interview goes live on June 3rd, and you can listen to all 21 expert interviews for free. Just click here to sign up. My interview concentrates mostly on relationships, especially with narcissists, the Drama Triangle, and shamanic energy work. I hope you will check it out. It’s been a while since my last blog post. My life has undergone some upheaval in a good way in the past year, but it has left me little time to focus on writing, except to my email support clients. However, I had a wonderful opportunity to participate in Jenna Avery’s Author Insights this past month. Jenna has been featuring authors who have made it all the way to the finish line and published their work. Back in 2012 I had the pleasure of joining one of Jenna’s Writing Circles, which helped me complete my books. If you are an aspiring writer, you may enjoy my article about dealing bad reviews for my book series. You can see the article here. With my life calming down once again, I hope to return to writing my next book on Empaths and relationships, and to posting more here this summer. I’ve had a few questions around situations in which a relationship with a narcissist has ended, and ended badly, and lo and behold, a few months later, or even years later, the narcissist makes a request for a special favor despite all that had gone before. Clients come back to me stirred up, old wounds uncovered, resentment brewing once again. How can this person have requested a favor; what the heck is wrong with the narcissist? Empaths must remember that if we are healthy we tend to understand how a person is feeling, and we tend to respect boundaries, so we naturally do not ask favors of those people who have told us to go away. When we are healthy we understand that our feelings and needs are just as important as others’ feelings and needs. But for the narcissist, the narcissist simply cannot see anyone in their lives as important as themselves. The narcissist simply doesn’t care how other people are feeling. It is the narcissist’s feelings, needs, and requests that are important. Everything else takes second place to the narcissist. If you have read my book on the Fan-Hero Family System, you are familiar with the Enneagram Type Three, which I like to call the Hero. When the Hero is emotionally dissociated, the Hero usually starts behaving as a narcissist. While the healthy Hero is in pursuit of self-improvement and acts as an inspiration to others, the unhealthy Hero believes in the image he has of himself and of others in his life, and tries to protect that image even at the expense of others and in direct contradiction of reality. In the Fan-Hero Family System book I described the adult son of a Hero who broke off contact with his narcissist father because his father could not treat him or his family in a way that wasn’t damaging and hurtful. The son, my client, had explained to his father that his father seemed incapable of seeing that there were problems in the relationship, and therefore no change could occur. Unless those changes happened, my client couldn’t afford the negativity and crazy-making behavior from his father in his life. My client asked for no visits, and no contact unless the behavior was addressed. Basically since his father was incapable of even admitting there was a problem between them, the relationship was over for my client, even though the narcissist father wanted the relationship. As you can imagine, this breakdown of the father-son relationship was extremely hard on my client. It had taken him years of hard work to become clear enough about his family to see what was really going on, and to see how shallow many of the family relationships were. In his family, like with many unhealthy Fan-Hero Families, he was expected to serve the family and the image. He was a support person, not the person who should get the attention and glory, which always goes to the Hero. His wife had been punished because she had seen what the dynamic was, and then his children had been neglected and ignored. On one level my client had allowed this to happen, which had caused him major grief within his marriage. On another level, this was the set up of his family, so once he did his personal work he was able to release himself from these contracts and behave as the man he always wanted to be. His marriage repaired itself, and his children were free of any generational contracts from his side of the family. He knew he had been lucky to escape, and he only regretted that it had taken him so long. A year after he had ended his relationship with his father he received a letter from him asking for help. His father wanted to remove his son from his will so he could give that money to his current wife, who was likely to outlive him. His father had mismanaged his money, and wanted to fix the problem this way, but didn’t want to do so without his son’s approval. My client, who had assumed no inheritance was coming anyway, was angered by this intrusion and had the urge to write back to his father and tell him to jump in a lake. He was surprised that his wife found the letter hilarious—she encouraged him to not respond at all. While my client ended up deciding not to respond to his father’s request, it was a good opportunity to look at the mind and motivations of the narcissist, especially the unhealthy Hero type Narcissist. While a healthy person would feel extreme shame and embarrassment at writing such a letter, the narcissist has no problem with this sort of request because he is too emotionally dissociated to feel uncomfortable feelings of shame and of embarrassment. He doesn’t have that natural check in place that the rest of us have, which is the main benefit of being able to feel and to handle our uncomfortable emotions. Because the narcissist only considers himself, he doesn’t consider what effect writing such a letter would have on his son, or even on his wife for that matter. He is only fixated on getting his own needs met, which is to have enough money in his bank account so that his young wife won’t go back to work and possibly leave him in his old age. Also notice that in this case the narcissist also avoids responsibility for his mismanagement of money and for the ensuing consequences by asking his son to give him his approval. By making it a joint decision he doesn’t have to shoulder all the responsibility for his actions. The narcissist also doesn’t see that his letter simply reinforces his son’s conclusion that he is incapable of having a healthy relationship. He doesn’t see or care that he makes it appear that his wife has only married him for his money. Another point Empaths don’t realize is that the Narcissist can make such a request because he has nothing to lose. Since he doesn’t feel uncomfortable like most people would, there is no cost in asking for a favor. Either way, he wins. In this particular case, the narcissist wins no matter how my client responded. The narcissist can tell himself that he did his best in contacting his son if his son doesn’t respond, and it’s his son’s fault for not helping him. He wins if his son contacts him and says go ahead since he can then share responsibility for fixing his mismanagement of his money. He can tell his wife that his son knows about the change in the will, too, so she won’t feel like she’s imposing on the father-son relationship. But he also wins if his son says no because he can tell his wife that his son cares more about the money than her financial security. In all three cases the narcissist avoids responsibility, can transfer blame, and also lightens any emotional discomfort that may be pushing through his repression. While my client was angry, and while he understood on a whole new level how deep the narcissism ran in his family, he was grateful he had already ended the relationship with his father. If he hadn’t done his personal work and had still been in contact with his father, he would have had to deal with his father’s financial problems. It would have been enough to end the relationship at that point, but then his father could blame the ensuing rift on his son’s attachment to money, rather than deal with the cleaner break my client had made months before. The narcissist’s behavior isn’t surprising here, even though many Empaths are revolted and baffled by such behavior. Narcissists have no compunction asking for favors that benefit them to the detriment or discomfort of the people around them. If you are in relationship with a narcissist, keep this in mind. A narcissist is too wounded to be able to care about you as you care about him. He is simply incapable of doing so. He may say he loves you, but remember that his love for you is secondary to his own needs and feelings. Staying in a close relationship with such a person without keeping this fact in mind can lead to deep hurt and betrayal. Don’t expect a narcissist to treat you as you would treat him—that simply misses the point of what it means to be a narcissist. Recently I had several people tell me that they couldn’t possibly set limits on a relationship because the person causing trouble was a long time friend or was a family member. Even though my clients and friends were mistreated and this mistreatment was nothing new, they all felt that they had to put up with this behavior in order to consider themselves kind, loving, and tolerant people. Is this really what friends and family do for each other? Some family and some friends, apparently. But this does not mean that it is healthy to tolerate such behavior. Yes, everyone is flawed, yes, everyone has bad days, yes, everyone acts at their worst when under stress. I am not talking about the flawed person who works on themselves to make their impact on others the best that it can be but blows it on occasion. I am talking about people who have no interest in taking responsibility for themselves and the impact they have on others. These are the selfish people that we are told by colluding family and friends that we must accept for being where they are. Sure, accept them, but Don’t Hang Out With Them. DON’T make them your intimate partner. Don’t think you have to be with them in order to be a loving, spiritual person. That is the Rescuer Trap in full force! Instead, set boundaries so that you are not so affected by their toxic behavior. Instead go find people that can express that love and kindness to the degree that you can. Find people who have grown as much as you have in self-love and self-worth. Welcome into your tribe those that understand the difference between self-absorption and self-knowledge. The Rescuer Role assumes unconsciously that we are better than others. The Rescuer assumes that the other person in the relationship is so flawed that he/she deserves special treatment and excuses. The Rescuer unconsciously sees the other person as a Victim. If we finally decide to leave a situation that is draining or toxic to us, the Guilt Tripping starts, and we are told (and we believe) we are bad people for taking care of ourselves. We are selfish and unloving, and even unspiritual for being so cruel to the Victim! The Rescuer Role and Drama is reinforced. Step off the Drama Triangle. That means looking at the other person in the relationship and seeing them as capable of change as you are. That means looking at them as having had made choices in life to get them where they are at. That means looking at the standard that you hold for yourself and only choosing people with similar standards to be close to you. The key here is the freedom to choose. If you had free choice, is this what you would choose for yourself? Choice limits us. We human beings have limited time and energy. If we choose people we don’t like, who drain us, who annoy and anger us, then we don’t have room for people who uplift us, make us smile, and inspire us. Not only that, but in these toxic situations if we choose to not set healthy limits, we are also choosing to collude in keeping up the other person in an unhealthy state. I had a question a few days ago regarding health and what my perspective as a shaman was. Mary asked, “These days with our polluted industrialized unnatural ways of living, it seems that many new illnesses have come forth such as autism, MS, chemical sensitivities, gene mutations, cancer, etc. Thus, these physical things are deemed causes of illness. Most alternative doctors are focused mostly on detoxing and strengthening the physical body. But what happens if people continue to be ill and dysfunctional despite doing all the right things? Some say that all (physical) illness starts “in the mind”, and that ultimately, the way to heal is with healing the mind (emotions), and/or spiritual. This is a great question. One thing that I think our western view of medicine has not caught up to yet is this idea of the mind-body connection, as if the mind was separate from the body and visaversa. The way I see the body, there is no mind-body connection because there is no separation. Our physical bodies are encased in our emotional/mental body, which is encased in our mythic/soul body, with in turn is encased in the energetic body, (and some healers can see several layers in that body as well.) An injury at one level effects everything else. The energetic body isn’t just an outer shell–it goes through all the bodies, and the soul body goes through the mental/emotional body and physical body. In other words while it might be helpful to think of these bodies as nested shells, they really aren’t. If you have an injury at one level, it will at some point show through at the other levels. If you have a cancer that starts at the energetic or the mythic level from soul loss, you may be able to surgically remove it at the physical level, but if it is not treated at the mythic level, it can recur. If you come into your body with an injury from a previous lifetime or from a family imprint, it could be set up at the mental/emotional level as mental illness or a physical problem. Their is no one-size fits all to these health issues. Each person is different! And of course, if you eat terrible food and breathe in polluted air, that is going to hurt your physical body and perhaps start hurting you at the mental/emotional as well. If you endure a terrible tragedy on the emotional level, this can cause a deep imprint at the mythic level. It simply all depends. Of course, we must take responsibility for our health and our healing, and yet we need to be realistic and gentle with ourselves as well. I’ve had several clients come to me and tell me they’ve created their cancer or other chronic illness. Our system is simply too complicated to assume that. Yes, there are cases in which a person can shift at the mythic and energetic levels and their physical problem goes away completely. That is wonderful, and that is real. However, with many chronic health problems, telling ourselves we’ve done it to ourselves isn’t always helpful. My take on health is to look at how I am doing at the physical, emotional/mental, mythic, and energetic levels, and treat myself well. Am I eating right? Am I getting the exercise my body likes? Am I limiting my exposure to environmental toxins? Am I hanging out with people that make me happy and inspired rather than irritate me and drain me? Am I limiting my intake of bad collective news that I can do nothing about? Am I able to be at the mythic/sacred level without anything in the way? (If not then I go to my shaman for some work) Am I up to date on keeping my living space clear energetically? Am I unentangled in my relationships? All of these will affect our health, and deserve attention. On top of this I am an Empath so I need to be extra careful about taking on the vibration of friends and family that I am very close to when I am worried about them or when they are ill. Some of you have heard about how I developed gall stones when my father did, and how those miraculously disappeared after he had surgery. Most Empaths tend to process emotional overwhelm on the physical level–we can help ourselves out by putting that extra emotional energy into a sandpainting. We can create better boundaries with our loved ones by building altars around the relationship. Empaths can also tune into the collective and make themselves chronically ill as well. We have a few more challenges than non-Empaths to deal with! So, yes, health is complicated. Mary, if you are suffering from chronic issues, and you are an Empath, you want to make sure that energetically you are fully “in” your physical body. Many Empaths aren’t. For that you will need to go to a shaman or another energy healer that can help you get all the way in. Sometimes this happens because of a hard birth experience. When we aren’t fully in our bodies, other vibrations can start taking up partial residence. Those will need to be evicted so to speak. Again, a shaman can help you with that. I’m going to assume that you are taking care of your physical issues by seeing good doctors that you trust, and that you are taking good care of your emotional health by making sure your relationships are healthy and supportive. If not, find those trusted health professionals and also a good therapist! Eat the best food you can afford, treat yourself as kindly as possible. Look at yourself from these different levels of reality and get the best medicine that you can afford. I hope that makes a difference in your health and happiness! I’m pleased to announce that my good friend and colleague, Jim Peterson, has recently published his first book of inspiration writing and poems collected over the past ten years. I had the honor of helping Jim walk through the publishing process, and I can attest to the beauty and comfort of this book. It’s the type of writing that I keep on the bedside table to read just before bed. I wanted to pass this news along to you. You can find his book, Wisdom Rising, on Amazon. My books are once again available for sale in pdf form through my website. Also, as some of you have noticed, I had taken a break over the past few months. I am now returning to writing, answering comments on my blog, and email support. If you have read my books, and they had a positive effect on your life, please consider writing a review for me. It really helps! thanks so much everyone! New books are coming! As I’ve spoken about in my book on the Archetypal Drama Triangle, Empaths can get into trouble when we blame our emotional state on someone else. We can use our unhappy emotional state as the justification for bullying or attacking another person. While this can seem justified it is never a creative action, and it always serves to spread the negativity in a wider circle. I had this experience myself over the past week. For the first time I received negative reviews on my books I have published through Amazon, first in the UK and then in the US. In one case, the reader decided to start with Volume Four on Shadow Work, and of course couldn’t understand the book since important concepts necessary to understanding Shadow Work were introduced in the first three books. Instead of taking responsibility for a poor choice, the reader blamed me and gave my book a bad review. Similarly another reader bought all five books but for whatever reason read the last book first, became depressed, and then gave all the books a bad review while admitting to not reading them. Anyone who puts their work out there is bound to be attacked in this fashion, especially from people who do not take the risk to put their creativity out in the world. Theodore Roosevelt ignored these attacks from people who were not “in the Arena.” On an objective, logical level I know these reviews are not important, I know they show the state of the reviewer and not my work, and I know that in a few days I’ll forget about it. However, for Empaths this type of attack is much harder to shrug off than for the non-Empath. We need to give ourselves a break for our emotional state and but not pass our crankiness on like these reviewers did. We need to go to our support system and ask for support. I also pampered myself, did a sandpainting, had a salt bath, and vented to trusted family and friends. I did this over the past few days and felt restored, validated (Empaths love validation) and ready to move forward again. I write this post to make two important points. If a feeling arises that is uncomfortable, try to examine it before acting on it. If it is obvious that it is the other person’s issue, like the response from these reviewers, do what it takes to take care of yourself so that you can shrug off the negativity without hurting yourself or the people around you. See if there’s a Right Action to take, like my deciding to put all my writing into one volume, that will make the experience into a positive, life affirming one. Then slather thanks and gratitude on your support system. Secondly, what would have happened if the reviewer who became depressed by reading my family system book had taken responsibility for his emotions? Instead of disliking and attacking me personally, the responsible action is to look at what is the true source of the depression, sadness, and ensuing anger, which has to come from something within that reviewer. Stop before shooting the messenger and look instead for the wound that needs healing. These actions are the heart of Shadow Work. This is what makes Shadow Work difficult and confusing. It seems like the other person is to blame, but it is really an opportunity always to look within. As a final request, if my books have helped you on your own journey, please consider writing a favorable review. I would appreciate the love and support. Thank you.